These are slide pictures of mine from the 1980’s that I changed to black and white and updated today. They probably don’t qualify for neo-noir, but some of them have a hint of noir about them. We’ll start at the Bay Bridge and end up on Twin Peaks. This slide is from 1983. AT&T Park and the San Francisco Giants turned this run down area into one of the most popular places in the City. In fact, people were already heading out to park this morning to watch the Giants play the Los Angeles Dodgers when I took the contemporary picture. The Giants won 4 to 2! I’m not positive where I took this 1983 picture of the South of Market area, but it was probably on Spear Street between Harrison and Folsom. The pile drivers have long since conquered this area so I had to move down to Folsom to get a reasonable comparison. The white building in the center of the vintage picture is on the corner of Fremont and Mission Streets. This building is to the right of the enormous Sales Force Building in the center of today’s shot and blocked by other buildings now. That’s the Fmbarcadero Freeway stretching across my 1983 picture. Market Street at New Montgomery with the Palace Hotel on the right: I think I took this one in 1985. 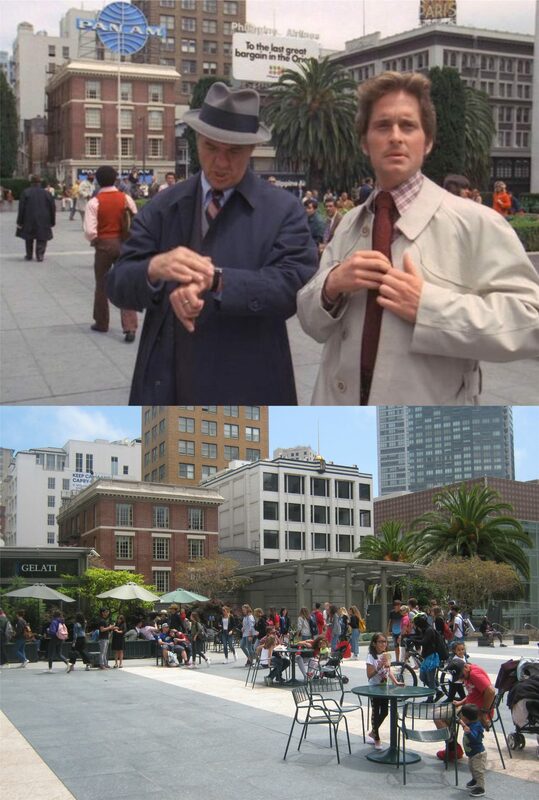 The tall Building in the background of both pictures is the old Pacific Bell Building, for many years the tallest building south of Market street. This is at Bush Street above the Stockton Tunnel looking down toward the Financial District in 1985. The tall building in the center is the Russ Building on Montgomery Street. Just a few yards behind where we’re looking is Burritt Alley where Brigid O’Shaughnessy shot Sam Spade’s partner Miles Archer in ‘The Maltese Falcon’. This is a zoom in shot up Mason Street and Nob Hill near Ellis in 1985. This used to be a pretty bawdy section of town; I’m surprised I didn’t take more pictures in this area back then! My digital camera doesn’t zoom is as well as my trusty 1980’s Canon Camera did, (I still have it) but I gave it a try. That’s the parking garage on the corner of Mason and O’Farrell on the left. Market Street west of 10th in 1985: The old Seals Stadium sign on the streetcar gives the vintage picture a nice touch. Gawd, I’m referring to the 80’s as vintage! This was around the time they started running old streetcars along Market Street. This 1985 slide that I took from Twin Peaks matched up pretty good with a 1960’s picture taken by Michael Bry. These scenes are from the epilog of the last episode of ‘The Streets of San Francisco’ that Michael Douglas costarred in. In the fifth and final season, Douglas was becoming very successful in Hollywood and decided to leave the series. In a two part episode that opened the season and featured many guest stars including Patty Duke, Inspector Steve Keller (Michael Douglas) decides to retired from the police force after being grievously wounded, (for about the 20th time) to become a teacher. Michael Stone, (Karl Maldin) pulls up at Broadway and Taylor Street to let Keller out where he lives. This is a different address than his Telegraph Hill address shown in all of the previous episodes. Also in the car is his replacement Inspector Dan Robbins played by Robert Hatch. This scene is looking down Broadway from Taylor Street toward the east entrance to the Broadway Tunnel. Stone and Keller say their goodbyes. I was getting kind of sad watching this part! And so Keller wanders off into the sunset, except that he’s heading east. The show was not popular after Douglas left and folded at the end of the season. That’s a Mason Street Line cable car passing by down the street in the three images. That’s another quote from Herb Caen. He often referred to San Francisco as a “town”. To me a town is more like Mayberry, Bedford Falls, Midwich Village or something like that. Still, when I went over to the City, I mean the Town, to take these pictures today, I thought about how easy it is to get around San Francisco…… if you’re not driving. Most of the locations here are an easy walk or short Muni ride from each other. We’ll start on the southwest corner of Mission at 1st Streets. Across from where I’m standing a Walgreen’s Drug Store now occupies the spot in the building where a Foster’s Restaurant once was located. A short ride on the #1 Muni Line from the previous picture will take you up Sacramento Street to Joice Alley between Powell and Stockton streets in Chinatown. Cable cars don’t climb Nob Hill up Sacramento Street anymore like in the vintage picture from the early 1900’s, but Muni # 1 does, and is about the easiest way to get up Nob Hill. A block and a half back to Powell and you can catch a cable car for a late afternoon lunch at Fisherman’s Wharf, although I took this picture in March. The cable car line at Powell and Market Streets wasn’t long at all on this “helluva” nice spring day today! Well, the 2018 tax season ends today. I’m thinking of dying my hair to cover up the additional gray that developed since January. The computer system of the Internal Revenue Service Department crashed yesterday, so the tax season was extended to today, April 18th, the one hundred and twelfth anniversary of the 1906 Earthquake and Fire in San Francisco. There’s probably significance here, the IRS shakes up a lot of people too. Now I can get back to doing something that’s more fun than telling people, “I’m sorry, you’re not going to get a refund this year!” and that’s blogging. In honor of the occasion, I headed over to Market Street to do a couple of 1906 Earthquake pictures.